Our dinnerware is individually wheel-turned, decorated and fired by potter Charley Pritchard in our studio in Luling, Texas. All of our pottery is food safe and suitable for use in the microwave, oven and dishwasher (see cooking instructions below*). Orders of eight place settings or more (minimum of three items per place setting) receive an additional place setting free of charge. Please note that due to the nature of handmade pottery, exact shapes and details like rim widths and number of design elements such as painted stars and glass accents will vary from batch to batch. This is at the potter's discretion, and is based on customer feedback and design refinements we occasionally make. Final glaze results will closely match but will not be exact to photos. Please call (830) 875-6282 to order and for current delivery schedule. Coffee Mug - $18.00; Cereal Bowl -$18.00. 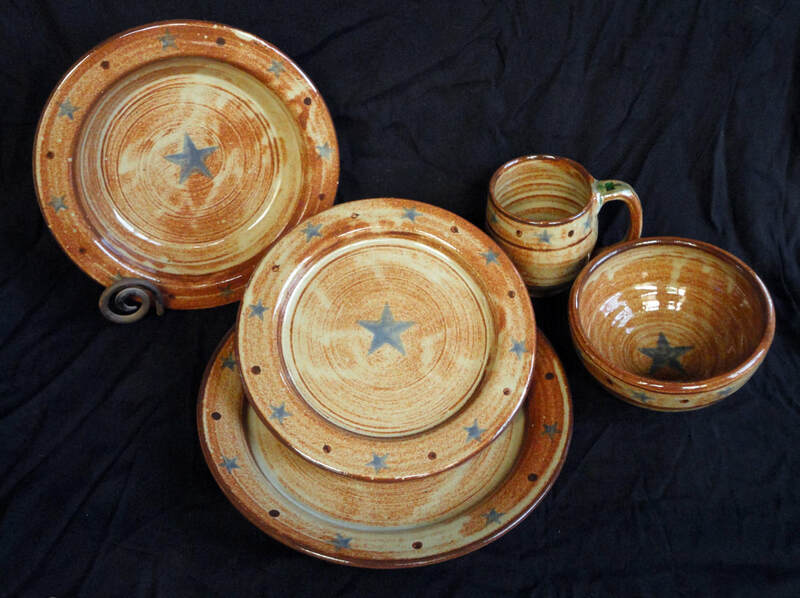 Texas Star Stoneware with "Custom Branding"
We can add your personal Ranch Brand to your Texas Star Stoneware Dinnerware. Pictured from left to right: Small Side Bowl - $24.00; Lunch/Salad Plate - $36.00; Dinner Plate - $46.00; Cereal Bowl -$28.00; Coffee Mug - $28.00. A one-time setup fee of $50.00 will be required for the artwork needed to apply one size of your Custom Brand to multiple pieces. If other sizes are needed, there will be an additional $30.00 charge per size. An "oversize" application of your Ranch Brand to larger pieces such as a platter or large vase will require a custom quote. Please note, the price per piece quoted above is based on a simple Ranch Brand design similar to the design shown in the photo. For a more complex design please contact us for a custom quote. Please call (830) 875-6282. Place your handmade pottery, with contents, in a cool, not preheated oven, and bring it up to baking temperature. DO NOT place pottery on a burner or open flame, or under a broiler. You may need to extend cooking time by 10~15 minutes. Remove pottery from oven using oven mitts and set on pot holders or trivets to protect counters and table tops from heat.